An interesting one and rather different. A client with a Solent waterfront property has permission for some seawall reconstruction but had extended the works some way further to complete repairs to the remaining derelict protection. This raised significant legal and policy issues under the Habitat Regulations as the intertidal area here is SAC (Special Area of Conservation), one of the Natura 2000 European conservation designations. We worked with the landowner, Natural England and the local planning authority to examine the effect that the extended coastal protection had had on the intertidal foreshore and to propose a way forward. 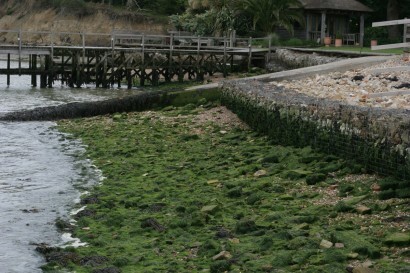 Through site survey and aerial photographs we were able to show that the scheme had succeeded in ‘packaging’ the historic scree of rubble and debris from various past attempts at coastal protection, into the more compact gabion wall, reducing coverage of the mudflats and penning in the remainder of the concrete. By removing material from the foreshore and using it to rebuild the wall behind, the scheme had increased the extent of unencumbered mudflat in the SAC. We were able to agree with all parties additional clearance of spilled rubble to further backfill the new defence as well as appropriate coastal planting and prepared ground for natural colonization along the gabion wall. The scheme was given retrospective planning permission.